No more foam on the wall! Barnes & Noble has nothing on me. I have a subscription to just about every DIY and design magazine available and an angry postman to prove it. Moving into a new apartment has encouraged me, and at times inspired me, to pick up some tools and leverage some of my creativity. Im not talking about tearing down walls and installing a new kitchen, but rather something more manageable considering my level of ability. Think audiophile Trading Spaces without the experts. These are projects with the goal of delivering functional improvements to my hi-if system and my new listening environment through semi-customized approaches and reasonable cost and time investments. Currently, room reverberation is of highest priority. Although my current listening room (living room) is twice the square footage of my earlier listening room (also the living room) and with slightly higher ceilings, it is a much livelier environment due to large windows lining one side of the room and less carpeting on the floor. Although overwhelming primary and secondary reflections are common problems and plague most audiophiles, they are not something that can be easily addressed in an aesthetically pleasing manner -- at least not in my opinion. Integrating tubular corner traps, open-cell foam, and acoustic panels into a dedicated listening room can work well because the room in question serves a single purpose: provide good acoustics in order to maximize the performance of the hi-fi environment and thereby enhance the listening experience. But, for many audiophiles, the listening room must also function as general living and entertaining quarters for the family. So unless your spouse doesnt care (never), or youre a 35-year-old caveman still grasping for those carefree college days (maybe), having a living room that breathes neo-classical recording studio may not R-O-C-K after all. Of course, depending upon your design tastes, some more decorator-friendly acoustic solutions may still not work in your home. If youve got the skills, try designing and building items on your own, especially if you have a limited budget. For those of you with less-developed hands and/or larger budgets, check out the audiophile rags, online resources, and the yellow pages for a local source to help you integrate acoustic solutions into your home. In this case, a little bit does go a long way. And for those of you who have not even considered this critical "component," shame on you. Acoustic treatments will provide the biggest improvement for your dollar, no question -- except for magazine subscriptions. Oh, and that postman? Dont believe his bitching. His back was screwed up before he picked up my route. They look like stone. Are they stone? My taste in home design runs along more modern paths, generally mid-century modern mixed with whatever my wife lets me sneak into the bedroom. But luckily this style lends itself well to some of the newer, more contemporary acoustical treatment offerings, some with real design flair and acoustical benefits for your room and system. I first read about Snowcrash Soundwave sculptural wall panels inside the text results of Google keyword "acoustic+wall+treatment" search #423. My wife had been furiously researching acoustical wall treatments in order to fend off my inevitable Sonex foam suggestions for the wall behind the loudspeakers. In her travels throughout the online equivalent of the grad-school library stacks, she located a promising listing for a "Soundwave" panel. Hitting the link, and subsequently the products homepage, provided a good amount of information surrounding the Swedish companys strategy regarding the product, lab results from acoustic tests, and photos of existing installations. "The Soundwave wall panels are designed to enhance the acoustic properties of any interior used for human communication and social interaction, such as office environments, restaurants, conference rooms, foyers etc. While most acoustic products are discreetly concealed in the fabric of the building, Soundwave panels combine functionality and aesthetics. The panels resemble sculptural 3D wallpaper, making acoustic control a visible dimension of environmental design." Interpretation? 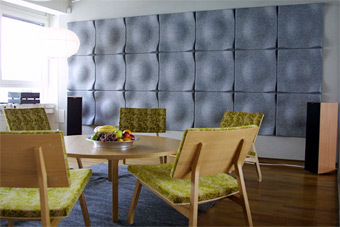 Snowcrash has developed an acoustic sound panel that looks great and has sonic performance to match. This sounded great to me, but after reading through the webpages on the Snowcrash website, it appeared that the Soundwave line of sound panels were primarily targeted toward commercial applications and not homes. Of course, this shouldnt matter, and it was just another reason to get some panels into my home for a demonstration. After some difficulty locating a dealer in my area, I finally walked into The Apartment, a home-furnishings store situated in downtown New York City. Primarily a mid-scale furniture and accessories store, The Apartment had some Soundwave panels on display, but positioned in sub-optimal locations for sound absorption or diffraction. The Apartment was obviously carrying the line of panels for aesthetic reasons -- wall sculptures that were cool to look at and much less expensive than the paintings lining the walls of neighboring galleries. At $70 to $90 per panel (depending on model), these 22" x 22" x 3" squares are reasonably priced. Heck, basic Sonex open cell foam runs about $15 per equivalently sized panel, and RPG Skylines are about $150 each. In terms of price, the Soundwave products straddle the competition, but in my opinion, they surpass them both in terms of physical attractiveness and perhaps even performance. Constructed of molded polyester fiber over plastic, the range of Soundwave panels consists of four models, each with different functional and aesthetic qualities, and each available in a limited number of colors. These panels have been fire tested, with published results available on the Snowcrash website The results include those for UK, Swedish, and French tests only. I did not see US results, so stateside folk should take all necessary precautions and use at their own risk. The Swell panel is, "designed to be used as lightweight sound absorbers in the upper frequency range [500Hz and above]." This model has the look of spheres pushing through a felt-like membrane, very organic. When installed in large numbers, the visual effect can be quite dramatic, as the texture takes on a continuous form that is somewhat hard to appreciate when looking at a single panel. The Swell Diffuser is similar in shape to the Swell, but it lacks the fibrous felt-like covering. As the name implies, it provides some sound absorption, but predominantly sound diffusion. This effect may be desirable in instances of overly damped rooms or halls. The Scrunch panel has similar acoustical characteristics to the Swell panel, but it has the surface appearance of crumpled paper. Again, this panel is intended for sound absorption. Finally, the Swoop panel, "is a specially designed class A [heavyweight] broadband absorber with extended efficiency in the low frequency range [150Hz-500Hz]." According to the manufacturer, the Swoop is, "very efficient in reducing the reverberation time (sound bouncing around) in a room." Looking like concrete Swiss cheese, these were the panels that ultimately found their way into my listening room. I first centered a single gray Swoop panel on the wall behind my loudspeakers and positioned it slightly above my television. After aligning this first panel and attaching it to the walls surface with the supplied adhesive-backed Velcro strips, I proceeded to line up the second and third panels in a flanking formation to the first panel. But I found the supplied Velcro to be ineffective at holding the panels in place for more than a few hours without having one or more panels sag out of alignment with the others. I switched to some industrial-strength Velcro-like strips from Radio Shack, the ones with all-plastic "fingers" on both sides (no hooks and felt), and found it to work much better. My wife and I were very pleased. The set of Swoop panels integrated well with our living rooms overall design strategy. We even thought their unusual texture and composition would become an obvious conversation piece for our guests. But I know theres no point in writing about this product if I cannot speak to its performance. So, you ask, "What about the panels' performance?" Well, not only do they look cool, but they work pretty darn well too. Replacing jazz with some metal (because I can), I was convinced that leading edges improved substantially over my non-Soundwave-panel-treated room. Kirk Hammetts vicious guitar attack on "Welcome Home (Sanitarium)" from Metallicas Master of Puppets [Elektra B000002H33] sounded meaty and crisp, with exceptional pace and speed. I had no difficulty discerning each note throughout the extended intro, nor did I ever find myself concentrating too hard in order to listen to the music. The instruments and vocals were available and obvious, leaving me to concentrate on more important things, like perfecting my moves for the upcoming Air Guitar Championships. I was unable to evaluate the Swoop panels performance when installed on the rear or side walls of my room as my hi-fi setup prevents such experimentation. But I did try adding three additional panels to the front wall and concluded that this was an even greater improvement to the overall sound, when compared to the effects of just three panels (is anyone really surprised?). Again, decay improved, effectively increasing perceived resolution as well as solidifying the quickness of individual notes, even collective lower-midrange rhythms. Filling the tray with Miles Davis' Complete In a Silent Way Sessions [Sony B00005QGAS], I was again impressed by the Swoop panels ability to tighten up the sound, but less impressed with the panels ability to tame low-bass problems such as low-frequency room nodes and bass slap echo. I found low-frequency issues were better addressed using a traditional absorptive corner bass tube, triangular foam corner trap, or a Helmholz radiator. In my opinion, although listed as having efficiency in the low-frequency band, the Swoop panels effectiveness stops at the lower midrange. But this appears to be consistent with the manufacturers primary intent to improve intelligibility in commercial applications such as conference rooms but should not overshadow the panels ability to significantly improve the sound in residential music-reproduction settings. The Snowcrash Soundwave Swoop panels are a welcome addition to my living room and my hi-fi system. They look great, are well constructed, and provide obvious and tangible sonic benefits. Most audiophiles understand the importance of acoustical wall treatments, but many, like myself, refuse to compromise aesthetics for performance. Perhaps its part of growing up and owning your first home. Perhaps its living with a wife who rules with an iron fist. Just kidding, Dear. Although some audiophiles may not find the line of Soundwave panels visually acceptable, Im certain many audiophiles and music lovers will jump on these products -- if not for their looks, then for their exciting sonic performance. In the future, Im going to try adding additional panels. At some point Ill hit diminishing returns and the incremental performance enhancements will taper off. But then again, the more panels you add, the more dramatic the effect. And at $70-$90 per panel, the Soundwave panels are reasonably priced to allow plenty of experimentation without killing your diaper budget. Im also planning on trying some of the other models in the Soundwave range, most likely the Scrunch or Swell panels, to discover if they are similarly effective at taming acoustic reflections and improving overall sound quality. Locating the panels might be a bit difficult, as distribution in the United States may be limited, but think of the search as a quest for wonderful home furnishings that also provide real benefits for your sound. In this way, both you and your spouse will be happy. Prices: $70-$90 USD depending on model and color.